It isn't every day that a company like Microsoft admits that its mobile browser isn't up to snuff compared to its competitors, like the iPhone or Android devices. But that's what Microsoft did on Thursday, acknowledging that websites viewed using Internet Explorer 11 on Windows Phones don't provide the same rich browsing experience as they do on rival platforms. Naturally, Microsoft said it would fix this, via the version of IE11 built into Windows Phone 8.1 Update. 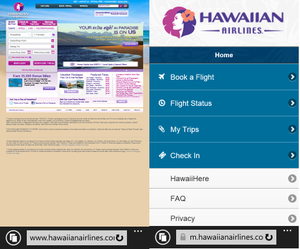 The Hawaiianairlines.com website rendered by Internet Explorer 11 for Windows Phone 8.1 (left) and IE11 for Windows Phone 8.1 Update. Microsoft said that it had tested the new browser on the top 500 websites and found that it improved the experience on more the 40 percent of them. "Based on your feedback, we pursued a web experience for IE users consistent with what is available on iOS and Android devices—even where this meant we would be adding non-standard web platform features," in a blog post authored by Adrian Bateman and Frank Olivier, both program managers for Internet Explorer. "We believe that this is a more pragmatic approach to running today's less-standardised mobile web." According to Bateman and Olivier, the problem dates back to the origins of the mobile web—which was written for iOS and then Android. Web developers would write to the browser—but wouldn't make the distinction between Internet Explorer running on Windows and the mobile version included on Windows Phone. "One of the most significant issues we saw was related to sites not detecting that IE on Windows Phone is a mobile browser and therefore providing desktop content," Bateman and Olivier wrote. "This often results in sites displayed with tiny text that you need to zoom in to read and then pan around. It also often means more data is transmitted over the phone's data connection because the content isn't mobile optimised. Images are large and many more ads are downloaded and shown." 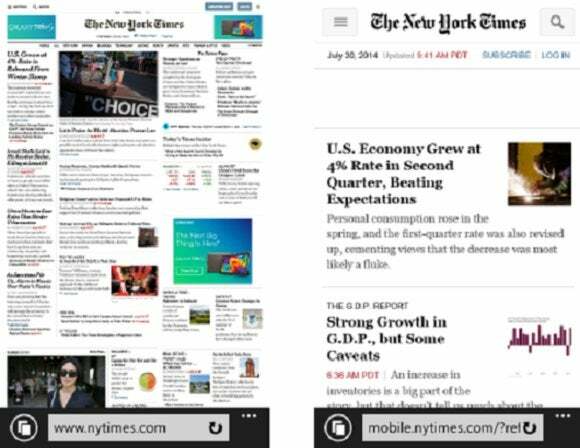 In other words, sites like the New York Times (top) will look more like the image on the right, rather than the left. Microsoft also made a number of other changes, bringing IE in line with some of the other nonstandard or even proprietary features on other browsers. If you're not a web developer, you don't have to do anything. The updates will be delivered as part of the Windows Phone 8.1 Update that rolls out next week to those who have signed up with the developer track. And if you are, Microsoft has set up http://modern.ie/ to help you navigate the process.